Bangkok (Thailand) – April 28, 2017 (travelindex.com) – Even if the public is not voting for UNWTO Secretary-General elections, the media like to know (and sometimes predict) what is going to happen. 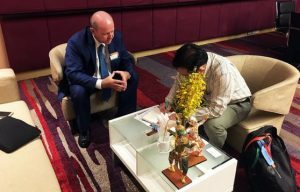 In Bangkok for the World Tourism and Travel Council, Alain St Ange met the international acclaimed Nation newspaper to explain his vision of tourism. The international press is now chasing him. This is an indicator 15 days before the elections. A great tourism leader is born.